Donald J. Trump, a Republican, is the 45th U.S. president. His term is from 2017 to 2021. Like most Republican presidents, he promised to cut taxes, reduce the budget and trade deficits, lower the national debt, and boost defense spending. Barack H. Obama, a Democrat, was the 44th president. His two terms were from 2009 to 2017. Like most Democratic presidents, he promised to increase taxes on high-income families, improve healthcare coverage, and strengthen regulations. Here's a comparison of their policies in seven critical economic areas: defense, recession recovery, health care, trade, regulations, the national debt, and climate change. Both presidents budgeted more for defense than any administration since WWII. Trump budgeted $576 billion for the Department of Defense for Fiscal Year 2020. But the DoD budget is just one component of military spending. There is also emergency funding that's not subject to sequestration. Congress allocates that for overseas wars. Trump budgeted $174 billion, for a total of $750 billion for defense. Military spending is also hidden in the Energy Department’s National Nuclear Security Administration. The Justice Department pays for the FBI. In addition, Homeland Security, the State Department, and the Veterans Administration also support defense. When these are combined, FY 2020 military spending is $989 billion. Obama eliminated Osama bin Laden, who was responsible for the 9/11 terrorist attacks. On May 1, 2011, Navy SEALs attacked the al-Qaida leader's compound in Pakistan. Later that year, Obama withdrew troops from the Iraq War. Three years later, renewed threats from the Islamic State group meant troops had to return. The Sunni-Shiite split affects the U.S. economy with its ongoing contest over the Strait of Hormuz. Although a religious war, this Middle Eastern battle between Saudi Arabia and Iran is of global economic concern. It revolves around who gets control of the waterway through which 20 percent of the world’s supply of crude oil passes. In 2014, Obama wound down the war in Afghanistan. Ending the wars in Iraq and Afghanistan should have reduced annual military spending. But it did not reduce it very much. At almost $800 billion, military spending was the largest FY 2014 discretionary budget item. It was one of the leading causes of the budget deficit and national debt. The War on Terror costs have added $2.4 trillion to the U.S. debt as of the FY 2020 budget. Obama used a non-military tactic to reduce the threat of nuclear war with Iran. On July 14, 2015, Obama brokered a nuclear peace agreement with Iran. In return, the United Nations lifted the economic sanctions it imposed in 2010. Iran's economy improved greatly from the lifting of sanctions, an effect from signing the nuclear deal. But Trump pulled the United States out of that deal. Obama also reduced the U.S. nuclear warhead stockpile by 10 percent. Obama received the Nobel Peace Prize for reducing the war in Iraq. 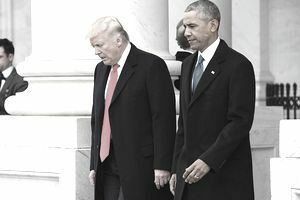 Despite this peaceful reputation and actions, Obama spent more on defense than any other president preceding him. In FY 2010, his first budget, he spent $527.2 billion on the DoD and $851.6 billion on total military spending. In FY 2011, he reached a peak of $855.1 billion total military spending. Both presidents are spending much more on defense than any previous president. Trump entered office without a recession to fight. But he won the election on the impression by voters that the economic growth should be better. He promised growth of more than 4 percent. His voters didn't realize that such fast growth is unsustainable and dangerous. It becomes a bubble that creates a recession. Here are examples of that boom and bust cycle. Obama faced the worst recession since the Great Depression. He used expansionary fiscal policy to combat it. He signed the Economic Stimulus Act. This act created jobs in education and infrastructure, ending the recession in the third quarter of 2009. Obama bailed out the U.S. auto industry on March 30, 2009. The federal government took over General Motors and Chrysler, saving 3 million jobs. Obama used the Troubled Asset Relief Program to create the Home Affordable Refinance Program. It rescued homeowners who were upside-down in their mortgages. Trump's approach to health care focused on weakening the Affordable Care Act. He stopped reimbursing insurers for their low-income customers. They raised premiums 20 percent. He made short-term insurance more available. It's cheaper than Obamacare but doesn't have the same benefits. He also allowed states to enforce work requirements on Medicaid recipients. Trump also signed the Tax Cuts and Jobs Act. It repealed the ACA mandate that everyone must have health insurance or pay a tax. That allows healthy people to cancel their plans, leaving insurance companies with costly sick people. As a result, premiums are bound to rise. Trump's supporters were frustrated with rising health care costs. They blamed Obamacare. Many of them had lost their employer-based insurance. Then they found that individual policies on the health care exchanges were more expensive. Others thought it was unfair that they had to accept policies that covered maternity care as part of the 10 essential benefits. Policies were also more expensive because the ACA prohibited annual and lifetime limits. It mandated that insurers cover everyone, even those with pre-existing conditions. The ACA legislation made changes to Medicare. One change was more coverage of prescription drug costs. It also began paying hospitals for quality of care, not for each test or procedure. Trump's health care plans did not try to reform these specific aspects of the ACA. Congress wanted to repeal the ACA taxes. In 2013, the ACA levied taxes on those earning $200,000 or more. In 2014, anyone who didn't obtain health insurance also paid a tax. The reason Obama pushed through the ACA in 2010 was to reduce health care costs. The cost of Medicare and Medicaid threatened to eat the budget alive. The No. 1 cause of personal bankruptcy is health care costs, even for those with insurance. Many policies at the time had annual and lifetime limits that were easily exceeded by chronic illness. Most of the Act's benefits didn't go into effect until after 2014. Obamacare closed the Medicare “doughnut hole.” More important, the ACA provides health insurance for everyone. It slows the rise of national health care costs. It allows more people to afford preventive health care. They can treat their illnesses before they require expensive emergency room care. In 2012, The Congressional Budget Office estimated the cost of Obamacare to be $1.76 trillion. Much of these costs went to expanding Medicaid and the Children’s Health Insurance Program to reach more low-income bracket earners. Trump withdrew from the Trans-Pacific Partnership. It would have been the world's largest free trade agreements. He threatened to withdraw from NAFTA, the world's largest existing agreement. He said he would negotiate better bilateral agreements. The Obama administration negotiated the TPP. It also successfully concluded bilateral agreements in South Korea in 2012, Colombia in 2011, Panama in 2011, and Peru in 2009. The administration negotiated, but didn't finish, the Transatlantic Trade and Investment Partnership. Trump has not said whether he would continue negotiations on the TTIP. Trump advocates trade protectionism. In 2018, he launched a global trade war. In January 2018, he imposed tariffs and quotas on imported Chinese solar panels and washing machines. In March 2018, he announced a 25 percent tariff on steel imports and a 10 percent tariff on aluminum. On July 6, Trump's tariffs went into effect for $34 billion of Chinese imports. On August 2, 2018, the administration announced a 25 percent tariff on $16 billion worth of Chinese goods. The end result of the trade war is still unclear, however, many economists predict that a prolonged trade dispute will end up hurting American businesses and consumers, and could even lead to an economic recession. Trump also promised to label China as a currency manipulator. Trump claims that China artificially undervalues its currency, the yuan, by 15-40 percent. If it didn't reduce its trade surplus with the United States, he would impose duties on its exports. As president, he imposed tariffs without officially naming China a manipulator. The dollar to yuan conversion and history revealed that, if anything, China's currency is overvalued. Obama signed the Dodd-Frank Wall Street Reform Act in 2010. It regulated non-bank financial companies, like hedge funds, and complicated derivatives, like credit default swaps. It made another financial crisis less likely. Dodd-Frank also regulated credit, debit, and prepaid cards. It ended payday loans with the Consumer Financial Protection Bureau. Trump would like to repeal Dodd-Frank completely. He claims it keeps banks from lending more to small businesses. On May 22, 2018, Congress passed a rollback of Dodd-Frank rules for these banks. The Economic Growth, Regulatory Relief, and Consumer Protection Act eased regulations on "small banks." These are banks with assets from $100 billion to $250 billion. They include American Express, Ally Financial, and Barclays. The rollback means the Fed can't designate these banks as too big to fail. They no longer have to hold as much in assets to protect against a cash crunch. They also may not be subject to the Fed's "stress tests." As a result, only the 12 biggest U.S. banks have to comply with this portion of Dodd-Frank. In addition, these smaller banks no longer have to comply with the Volcker Rule. Both presidents ran up record-setting budget deficits. Obama's stimulus plan added $253 billion to President George W. Bush's last budget to create the largest deficit in U.S. history. The recession reduced revenue by almost $600 billion. As a result, the FY 2009 budget deficit was $1.4 trillion. In FY 2010 and FY 2011, the Obama tax cut extension sent the budget deficit to $1.3 trillion. As the economy improved, each year's deficit became smaller. By FY 2016, it was $585 billion. But the deficit by president has increased under Trump's budgets, even though there is no recession. Trump's FY 2020 budget creates an $1.1 trillion deficit. Each year's budget deficit adds to the debt. But an economist at the St. Louis Federal Reserve found the reported deficit does not include all of the amount owed to the Social Security Trust Fund. That amount is called off-budget. Every president uses this sleight of hand to make deficits look smaller. As a result, looking at debt by president provides a better gauge of government spending. Obama added a total of $8.5 trillion to the debt during his two terms. But if Trump stays in office for two terms, he will add $9 trillion. Trump has betrayed his campaign promise to eliminate the debt. Even in his first four years, he's adding $5 trillion. That's as much as Obama did while he was fighting the worst recession since the Great Depression. Trump's plan to reduce the debt relies on increasing economic growth to 6 percent. Like most Republicans, he used tax cuts to spur that level of growth. In fact, Trump's tax cuts for the rich have not seemed to trickle down to ordinary Americans, and the debt load of the government is projected to balloon under Donald Trump. Trump promised to cut waste. But some of his strategies fall under the five myths on cutting government spending. These include cutting foreign aid, increase defense spending to boost growth and cut entitlement programs. Research shows these aren't the most effective ways to cut spending or boost the economy. On December 12, 2015, Obama led global efforts to finalize the Paris Climate Agreement. Countries agreed to reduce carbon emissions and increase carbon trading. Members decided to limit global warming to 2 degrees Celsius above pre-industrial temperatures. Developed countries agreed to contribute $100 billion a year to assist emerging markets. Many developing countries bear the brunt of damage from climate change, facing typhoons, rising sea levels, and droughts. At least 55 of the 196 participating countries must now ratify the agreement before it can go into effect. At the 2016 G20 meeting, China and the United States agreed to ratify the agreement. These two countries emit the most greenhouse gases. Obama announced carbon reduction regulations in 2014. He enacted the Clean Power Plan in 2015. It's a plan to reduce carbon dioxide emissions by 32 percent of 2005 levels by 2030. It does this by setting carbon reduction goals for the nation's power plants. To comply, power plants will create 30 percent more renewable energy by 2030. It encourages carbon emissions trading by allowing states that emit less than the caps to trade their surplus to states that emit more than the cap. On June 1, 2017, Trump announced the United States would withdraw from the Paris Climate Agreement. He promised to eliminate the Climate Action Plan and the Waters of the United States rule. He signed an order allowing construction of the Keystone XL and Dakota Access pipelines. They'd ship high-grade Canadian crude oil to refineries in the Gulf region. Trump pledged to revive the coal industry while remaining committed to clean coal technology. He signed an order that suspended, rescinded, or flagged for review several Obama-era measures that addressed climate change. He rescinded orders to address the link between climate change and defense. He initiated a review of Obama's Clean Power Plan because of its regulations on the coal industry. His administration is expected to allow states to set their own standards on coal emissions. Did Obama's Stimulus Plan Work?